Join us for our late October and November workshops for children! We are preparing the opening of our Labora Workshops for Children. 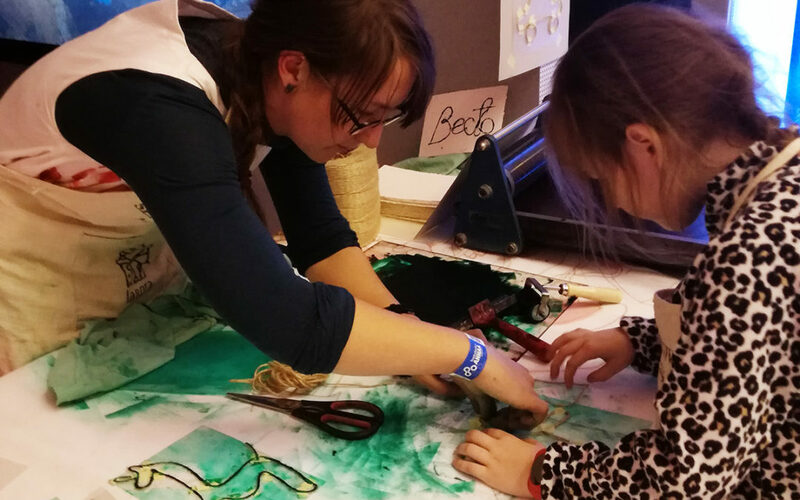 Here, children can develop their creative skills and together explore the traditional arts of printing, typography, and papermaking, enhanced with contemporary technology. They can attend with their school class or with their family – starting from the age of three! The grand opening will take place on the 12th of January 2019. You don’t have to wait until then! Sign up now for our free workshops that are coming up in just a few week’s time! What will you learn? Within half a day, you will make paper, print on it and try your hand at stop-motion animation! The theme of the month? Children’s rights as a way to celebrate the Universal Children’s Day on the 20th of November! We’ll discuss and artistically reflect on the Articles 28 and 29 – the right to education and the goals of education. Especially one of the goals of education – protecting our environment. Please sign up here. The number of participants is limited, so don’t hesitate to sign up now! All workshops are a part of the Creative Makers project and are free of charge. For more information, contact us at visit@labora.ee or +372 58147918 (Piia). We teach what we do, to spread knowledge of the traditional arts of letterpress printing, papermaking, and calligraphy. We wish to spark confidence in one’s creativity. Having taken part in our workshop, you should leave with the feeling of creative ownership, of having made something worthwhile and beautiful with your own hands. We want to show that working with one’s hands is intrinsically valuable, and that the process and people involved in it are of more value than the result itself.